To sustain your gardening tools and keep them in good condition for years to come, you should take the proper steps to make sure the metal tools maintain their durability and do not accumulate rust. Where and how you store your tools can make all the difference. Whether you need a place to store your tools for the winter or want to clear out space in your garage, a self storage facility can be a helpful solution. The winter season can significantly age and, perhaps, damage your tools if they are not properly cared for. Electric tools of all sorts, especially, should be attended to regularly. Smart storage can save you the burden of purchasing a new machine since time or winter weather can quickly age tools that are not properly taken care of. Moreover, a self storage unit can free up garage space during the winter so that your son does not have to park his car outside and risk being late to class because his car has frozen and will not start. Price can make the difference between short-lived and long-lasting equipment. Look for stainless steel tools as they do not rust. Similar to cheap paint jobs, coated metal and carbon steel are sure to rust over time if exposed to humidity. Sharpen (first) and oil tools regularly as needed. Make sure the tools are clean and dry before oiling. Tools can be oiled with a towel or rag that is damp with oil as long as it is not damped with other chemicals or water. Tip: WD-40 is oil based but should not be substituted for an oil to treat tools. Mineral oil is preferred, but motor oil can also be used and is cheaper. Wooden handles that show wear-and-tear should be sanded down and rubbed with oil. Tools that have accumulated rust should be hosed down with water and scrubbed with a wire brush, steel wool or sand paper until the rust is gone. This should be done before the tools are oiled. To save time, go ahead and also spray oil on screws, hinges, etc., whenever you need to take apart machines to sharpen blades. Remember to wear safety goggles and gloves when working with sharp tools. Regardless of the location in which you store your tools, you may want to consider storing them in a sand/oil mixture, which can be used for years. This can be done by using a five-gallon bucket filled with sand and a half gallon of mineral (or motor) oil. Shovels, hoes, pitchforks, etc., can all be stored in this mixture. These buckets may be used year after year as long as they are kept away from rain. Simply add oil each year as needed. Put clean tools in an empty plastic container, such as a trashcan. Also, consider hanging tools up on a rack or installing brackets to hold and organize your equipment. Hardware stores offer strong adhesives to hold tools that will not leave residue when you decide to remove the bonding agents. Both of these methods will keep your tools off of the ground, away from dirt and bugs, and out from underfoot. Gloves should always be kept in a closed container so your hand will not get eaten by visitors when you put them on. Consider using an empty coffee can, ice cream tub or a popcorn tin that can also hold random excess nuts and bolts that may be lying around. Space bags that use vacuum suction to remove air can also be a nice place to protect gloves when storing them for a longer period of time. Special care should be taken to store larger machines such as lawn mowers and big power tools in accordance with manufacturer directions. Hoses should be drained before storage. Also, roll up hoses to prevent them from getting cracked or being damaged during moves. Put chemicals and fertilizers in a locked case away from children and pets. 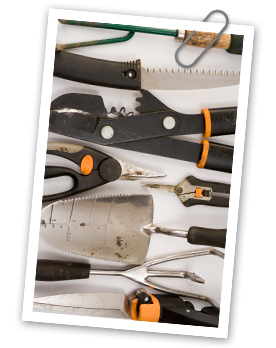 Gardening tools should be kept in a cool, dry place, such as a garage or storage unit. This will help keep your valuables away from humidity. Overall, be sure to take care of your tools to ensure their longevity and efficiency. Inspect your tools each season and take the proper steps, some of which are mentioned above, to keep them in good condition. Self storage can be an excellent solution when you want to free up space in your garage during the winter. On the other hand if you need more room but want to keep your tools close at hand, you may want to consider putting your items into a portable storage unit. Portable storage companies deliver a large box to your location, and then you pack your items in the storage unit at your convenience. You can choose what size of a portable storage unit you want, and companies usually allow you to store the box at a location of your choice. Either way, the portable storage company will haul the box away when you are ready. Visit StorageFront.com to find storage facilities in your area.